The Thanhouser film company was founded in 1909 by American theatrical impresario Edwin Thanhouser. It had studios in New Rochelle, New York and remain in operation until 1918, when Edwin Thanhouser retired. It had a relatively modest profile at the time, with few star name under contract (Florence La Badie, James Cruze, Marguerite Snow), and it has never excited much interest among film historians. Nevertheless, it was a sturdy and distinctive operation, with a particular penchant for bold literary and dramatic adaptations. It is also distinctive because the company, or rather the Thanhouser Company Film Preservation Inc, remains in family hands, run by Edwin W. Thanhouser, grandson of the film company’s founder. The present Edwin Thanhouser has been assiduous in helping to ensure the preservation of Thanhouser films, and has issued many Thanhouser titles on videotape and DVD. Volumes 7, 8 and 9 of the Thanhouser Presents series are being issued in September on DVD, with music by Raymond A. Brubacher. Together they present twelve titles which give good indication of the range of Thanhouser’s work. Volume 7 is Thanhouser Presents Shakespeare. Several film companies of the period produced one- and two-reeler Shakespeare films, but it took Thanhouser to film such ‘difficult’ and less familiar titles as The Winter’s Tale (1910) and Cymbeline (1913). 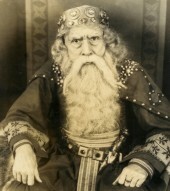 The third title is King Lear (1917), a feature-length production (two-and-a-half reels here, abridged from the original five), generally well-thought of by the brave band of Shakespeareans who can contemplate the idea of silent Shakespeare, and starring Frederick Warde (above). Volume 8 features literary adaptations: Charles Dickens’ Nicholas Nickelby (1912), King Rene’s Daughter (1913), Tannhäuser (1913) and The Vagabonds (1915). King Rene’s Daughter is adapted from a Danish verse play, Iolanthe, while Tannhäuser derives from Wagner. The Vagabonds is from a poem by J.T. Trowbridge – all evidence of Thanhouser’s creative ambitions. Volume 9 offers relatively more conventional fare: Daddy’s Double (1910), When the Studio Burned (1913), An Elusive Diamond (1914), The Marvelous Marathoner (1915) and The Woman in White (1917), based on Wilkie Collins and starring Florence La Badie, who died following an automobile accident not long after the film was released. When the Studio Burned is based on an actual fire which took place only the month before at the Thanhouser studio in Rochelle, with various Thanhouser players, including James Cruze and Marguerite Snow, playing themselves. The Thanhouser website has excellent supporting information on each of the titles, as well as details of the previous six volumes in the series. It also provides a Research Center, with a history of the company, biographies of leading figures, a filmography, a database in spreadsheet form of the 186 surviving Thanhouser films and their archive locations, and a range of articles on Thanhouser films. There is also Thanhouser Films: An Encyclopedia and History, written by Q. David Bowers and available on CD-ROM. And there’s an image gallery as well. Every silent film company should be so well served. I’m really looking forward to seeing vol. 7 in particular, given my silent Shakespeare interests (I hope there will be copies on sale at Pordenone). Will look out for Tannhauser too.